So you’re impressed by the Clevertouch touch screen hardware now what about the software? What can you do with this powerful touch screen technology? Well, there are thousands of educational apps out there but the Clevertouch suite covers pretty much all the essentials for teaching at primary and secondary level. Interactive technology makes learning so much more fun and interesting and this applies to all Clevertouch learning apps. 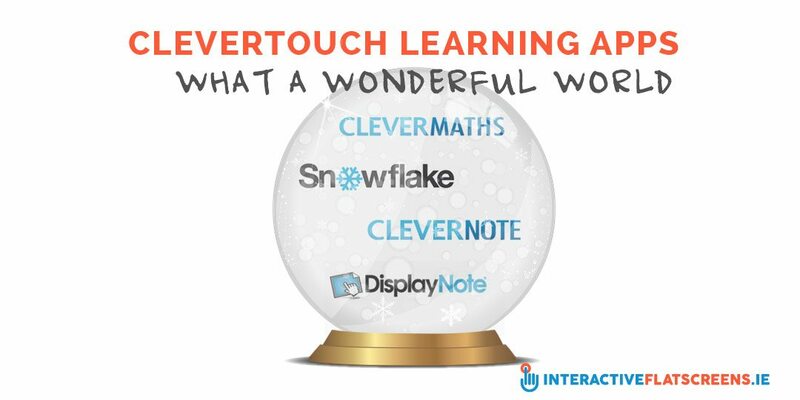 The Clevertouch suite includes Clevernote, Displaynote, Snowflake and Clevermaths. Clevernote is an annotation software that allows teachers to import files from an external PC, such as Word and Excel, PDFs, video and image files, and manipulate or annotate over them. It also allows pupils to interact and collaborate. Features include a calligraphy pen which facilitates writing and a rainbow pen which allows multiple users to each have a different brush stroke colour. It also includes an image bank with hundreds of high definition images and maps. Annotation is an essential part of teaching and the transmission of knowledge and has been for over 2,000 years. This powerful tool will make the teacher’s job easier so there is more time to focus on other aspects of education such as engaging with individual pupils. Check out our Clevernote training video here. Displaynote is a powerful presentation software that can be used in either an educational or business environment. Its main feature is that it allows multiple users with multiple devices to hook up with the interactive flat screen and interact with your presentation. Users can collaborate and the presenter will know which individual users are doing what. The presenter / teacher can invite individual users to make a contribution to the presentation / lesson. It makes the presentation / lesson more stimulating and dialogical for everyone involved. Snowflake is a suite of learning apps covering many different subjects aimed at primary level pupils. These apps allow for a high degree of engagement and collaboration which builds pupils’ confidence, communication skills and social skills. There is an emphasis on play and fun which makes learning easier. The apps are fully customisable so the teacher can adapt them to a particular curriculum plus avail of the many free lessons created by other teachers by joining the Snowflake Multi-teach Lessons Community. The apps cover many different subjects including maths, spelling, grammar, geography and biology. Clevermaths is another powerful annotation software with interactive tools that make maths and maths related subjects come to life. There are three subject areas: maths, physics and chemistry, as well as a whiteboard mode which allows you to choose between a number of backgrounds. Clevermaths makes maths and science fun. Some might sneer at this but it is true! The tools are so easy to use and the objects so easy to manipulate that it makes these traditionally difficult subjects more enjoyable. Almost anything that can be done in a lab can be done on screen. It is a fun and empowering experience to use this software: maths and science will never be the same again. To conclude, the future looks bright with interactive flat screen technology and learning software. Our children are going surpass us, which is only natural. As the song goes: ‘They’ll learn so much more than I’ll ever know’. And they’re going to have a fun time doing it too. 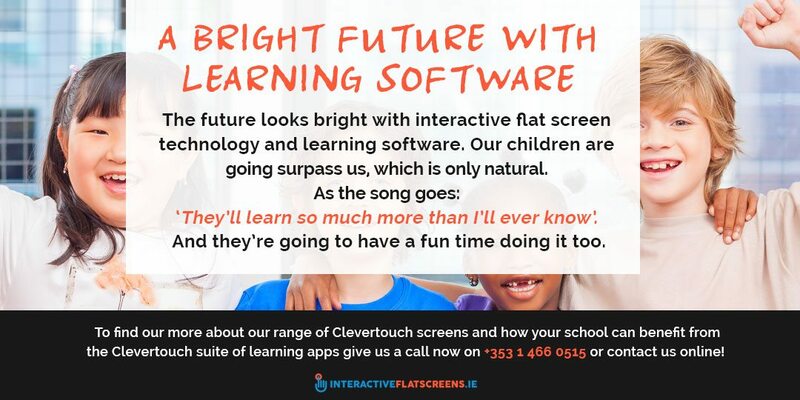 To find our more about our range of Clevertouch screens and how your school can benefit from the Clevertouch suite of learning apps give us a call now on +353 1 466 0515 or contact us online!